I strongly and completely recommend working with Bill, without reservation. Bill is talented, communicative, resourceful, and extremely helpful. We are in love with our new site. Thank you! Throughout the site we pair large, beautiful imagery with engaging content. We kept the design elements clean and heavily optimized the images to keep the site loading fast. 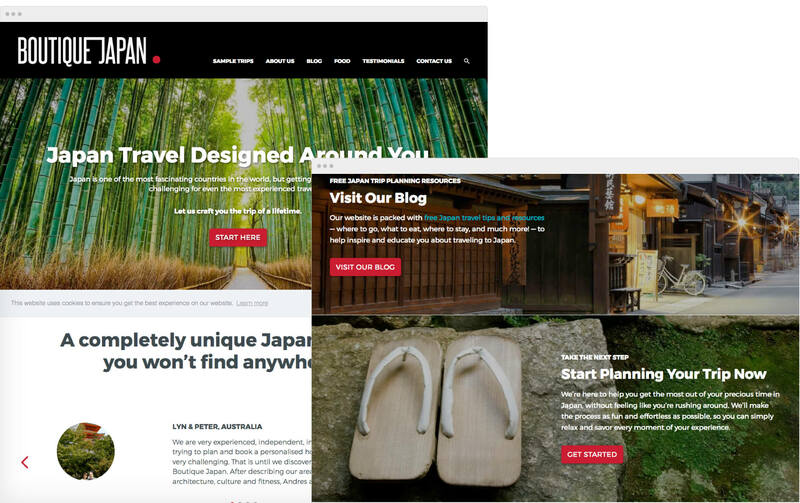 The most popular pages are the sample trips – examples of unique vacations they’ve crafted. They have lots of content, so we used collapsed sections for the day summaries. Editors can quickly create these pages without any code. To keep the site looking great across all devices, we use a full width layout with stacking content elements. A persistent header ensures easy navigation and search. Boutique Japan’s customers are their best salesmen. We built a testimonials area so editors can easily create, sort, and feature testimonials throughout the site.